Biography of Jean de Joigny French/Spanish Mannerist Sculptor. One of the most important Renaissance sculptors outside Italy, the French artist Juan de Juni was originally of Burgundian origin but spent most of his working life in Spain, where he was active from 1533. Judging from the content and style of his sculpture, he - like many northern artists of the day - appears to have studied the work of Michelangelo as well as the magnificent Hellenistic group statue of Laocoon and His Sons. Juan de Juni worked at Leon and Salamanca after which he settled in Valladolid. Specializing in religious sculpture, and in the expression of emotion for which the cinquecento is famous, he is traditionally ranked second only to Alonso Berruguete as the outstanding Spanish sculptor in the Mannerism style, while Berruguete himself described him as "the best foreign carver in Castile". 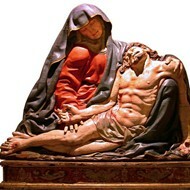 Juni's most celebrated examples of wood carving include the two groups of the Entombment (1544, Polychrome wood, National Museum of Religious Carvings, Valladolid) and (1571, Segovia Cathedral). The French sculptor, painter and architect Juan de Juni was born Jean de Joigny in Burgundy in France. Judging by his surname, it seems probable he came from the town of Joigny, and was attracted to Spain by the artistic activity taking place in the kingdom of Castile under Charles I. There were several connections between Burgundian and Spanish religious art, and in addition Charles had recently bestowed the archbishopric of Toledo on a young Burgundian named Guillaume de Croy. In any event, by 1533 Juni was sculpting in Leon, after which he moved to Salamanca before settling in Valladolid in 1540. An exceptionally prolific artist, Juni was well suited, both technically and temperamentally, to the special religious fervour that permeated 16th-century Christian art in Spain: something he shared with the expatriate Greek painter El Greco, who arrived in Spain about the time of Juni's death. In 1545 Juan de Juni carved an Entombment for the funerary chapel of Bishop Fray Antonio de Guevara, the Franciscan bishop of Mondonedo and chronicler for the Emperor Charles V, in the monastery of St Francisco in Valladolid. The following year he was awarded the commission to carve an altarpiece for Valladolid Cathedral. His other notable works include the design for a funerary chapel for the banker Alvaro de Benavente in 1557, and the Entombment group for Segovia Cathedral in 1571. Drawing on the sculptural traditions of his native Burgundy, his knowledge of Italian Renaissance sculpture and the intense forms of Mannerist art, Juan de Juni succeeded in imbuing his works with the spiritual pain, grief and suffering of the time. To convey these feelings, he created figures possessed with violent, often twisting movement reflecting the anguish within. Their faces are naturalistic, their expressions highly charged with religious emotion. Juni's exceptional carving is frequently enhanced by an imaginative multi-coloured "estofado" effect. To learn how to judge artists like the French Renaissance sculptor Juan de Juni, see: How to Appreciate Sculpture. For later works, please see: How to Appreciate Modern Sculpture. This group statue, commissioned by Fray Antonio de Guevara, bishop of Mondonedo, was housed in what was then the Franciscan abbey in Valladolid, on part of a reredos installed in the funeral chapel. The group numbers seven figures. Six are arranged in a balanced classical style about the figure of the dead Christ: The Virgin Mary, Saint John, Salome and Joseph of Arimatea, Mary Magdalene, and Nicodemus. The corpse's colouring (with its blackened congealed blood) and broken hands, convey the horror of death. The six others prepare the body for burial while expressing their distraught reactions to Christ's death. Overall, a complex and intensely expressive piece of sculpture, which uses the full gamut of movement, facial distortion and extreme posture to convey immense the type of religious fervour which was preached in Spain during the mid-16th century.